Hello-Hello, and Happy Friday. We have a fairly newsy post this morning, tidbits we hope you might enjoy seeing. The first involves Prince Harry’s visit to America. The young royal headed to Capitol Hill. He made an unannounced visit to the White House Mother’s Day tea, surprising children of active military parents. The tea party honored the HALO Trust. Harry is the Royal Patron of HALO’s 25th Anniversary fundraising efforts, below we see him visiting HALO Mozambique. 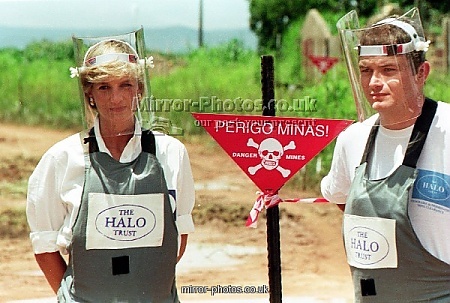 Some readers may recall Princess Diana’s involvement with HALO. “…at the dinner, he evoked the memory of Princess Diana’s ultimately successful campaign in 1997 to bring about a worldwide ban on landmines. Harrymania…crowds of girls had screamed and cheered for the Prince in Washington DC on the first day of his official tour of the US. 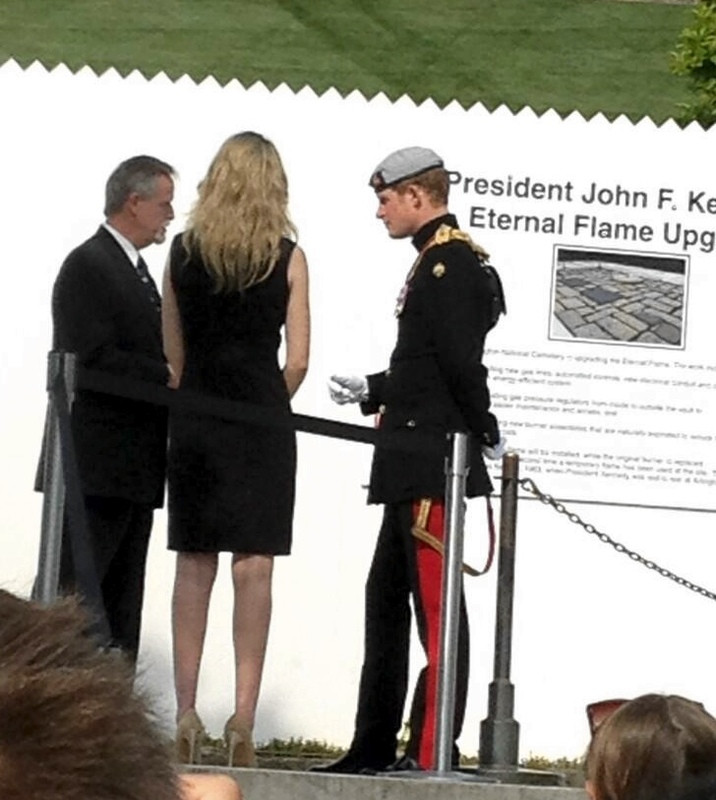 This morning Prince Harry went to Arlington National Cemetery. He started his visit in Section 60, this is where those who have died fighting the global war on terror are buried. For today’s solemn wreath laying ceremony he was in the ceremonial uniform of the Blues and Royals, that is his regiment. He also wore the Army Air Corps blue beret. Harry is an Apache helicopter co-pilot and gunner, he has served two tours of duty in Afghanistan. There was an Army Full-Honors Wreath Laying Ceremony. A visiting head of state will pay formal respects to the sacrifice of America’s veterans in foreign wars by placing a wreath before the Tomb. Similarly, other foreign ministers may also include a wreath laying here as part of their official itineraries. While not a Head of State, Harry is the Queen’s representative in this capacity. The grave of US Army Specialist Michael L Stansbery Jr, who died in Operation Enduring Freedom in Afghanistan on July 30, 2010, aged 21, was chosen at random out of the thousands of graves in Section 60. The headstone of Spc Stanbery, a recipient of the Bronze Star and Purple Heart, had six stones and glass beads placed on it by family members to mark their visits. Harry visited John F. Kennedy’s grave. He then moved to Arlington’s Tomb of the Unknown Soldier. Simon Perry of People magazine shared this photo, Harry saluting the Tomb of the Unknown Soldier. The handwritten note that was with the wreath. 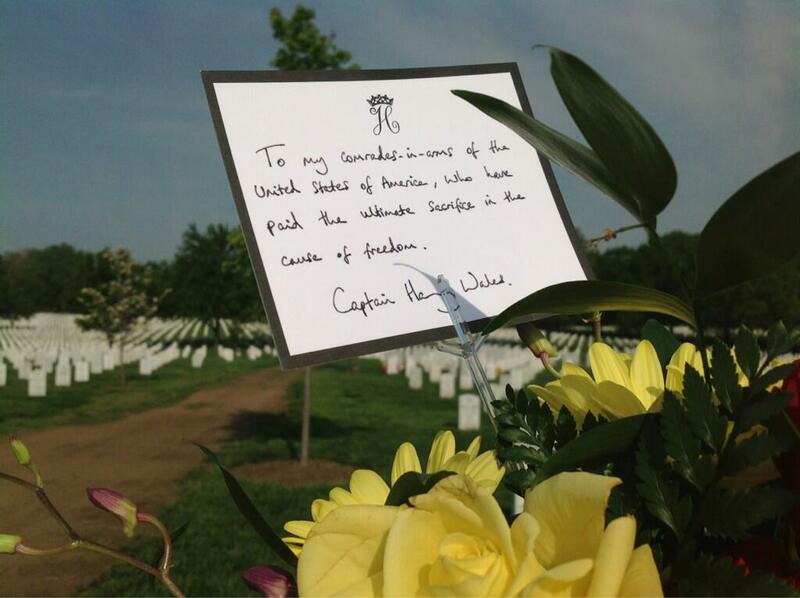 It reads, “To my comrades in arms of the United States who have paid the ultimate sacrifice in the cause of freedom,” and was signed “Captain Harry Wales”. The focus of Harry’s visit is supporting injured servicemen and servicewomen from both the US and UK, he will be visiting Walter Reed National Medical Center and attending the Warrior Games in Colorado Springs. The Games are hosted by the USOC and include teams from the US Army, United States Marine Corps, US Navy and Coastguard, the Air Force and Special Operations Command. Our other news involves One World Trade Center. The building is now at the symbolic height of 1776 feet, the spire atop the structure was permanently affixed by ironworkers this morning. The skyline in this morning’s haze and fog. We leave you with a few of our favorite looks from the Lilly Pulitzer spring/summer line. A better look at the Malibu Blazer.($198). The contrasting peter pan collar on the Andria Silk Top ($138) is cute as can be, but the way the piece hangs just didn’t wow me. You may have noticed the pretty pink belt in the photos, here is a better look at the Bow Tie Belt ($48). 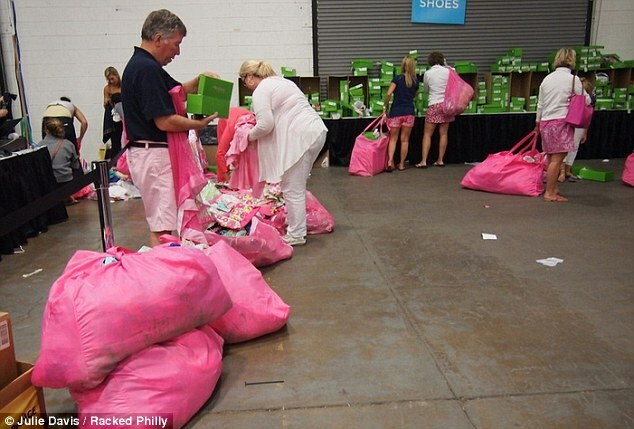 With that Pretty in Pink we say g’bye until next time! Hello-Hello, welcome to a Wednesday here at The Prepatorium. One that started out with some unexpected excitement (more on that momentarily). We are brief today, with only two tidbits to share. The first involves something that somehow escaped me, a book called “The Vitals Preppy Guidebook“. Five years before Lisa Birnbach decided to update The Official Preppy Handbook with True Prep, Rosecrans Baldwin and co. of the now elusive Vitals magazine penned an updated version that still holds true today. Skip shares scans in his post about the Guidebook. Vitals had a short tenure on the magazine rack, which was too bad, I remember reading several issues, it was a solid product. The Vitals Preppy Guidebook was published eight years ago, in the spring of 2005. No one will be surprised at the number of heritage brands shown in the Guidebook that remain with us yet today, like Nantucket Reds, Brooks Brothers, Barbour and others. There were sections on “Where to be seen,” “Where to spend money” and other tongue-in-cheek topics. Decor images included the Preppy’s Study. Does anyone remember this one…..? It looks like such a fun read. We also have another collaboration news to share, this time with a decidedly preppish slant. Stationers Dempsey and Carroll and J. McLaughlin have partnered on a collection of correspondence cards. As many readers already know, Dempsey & Carroll’s cards are simply wonderful. They’re all-cotton heavy stock with hand-bordered edges, accompanied with exquisite lined envelopes. 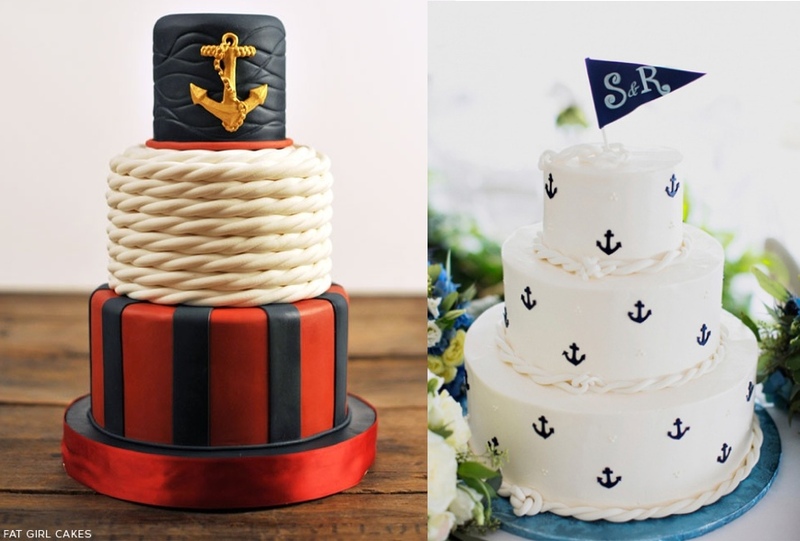 There are three J. McLaughlin designs available: from left to right, the Marrakesh, the Olana (yes, after the Frederic Edwin Church home) and Moroccan Paisley. The Correspondence Cards are $55 for a set of 10 cards and matching envelopes. There are also coordinating Gift Tags. The tags are $7 each, $35 for a set of 5. The paper goods are available online at both Dempsey & Carroll and J. McLaughlin, as well as select J. Mac stores. Back to that early a.m. excitement, it involved this. 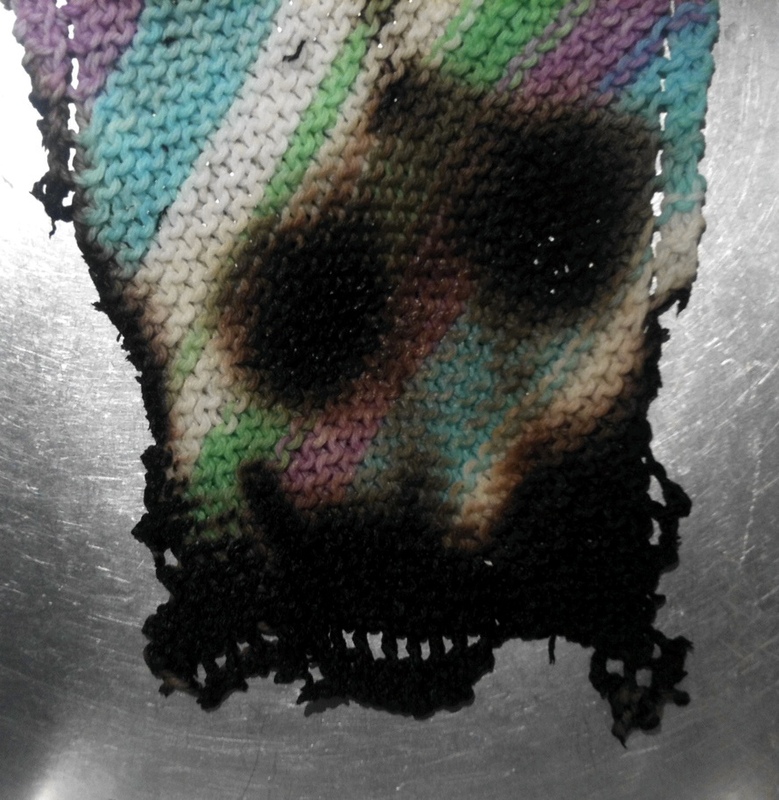 Someone who shall rename nameless (although you could always touch base with The Consort) wanted to “sanitize” a dishcloth. How else would one do that other than popping it in the microwave for a full 2 minutes??? Did I mention it was basically dry when it went in the microwave? Actually, there were lots of popping embers going, and no damage to anything other the dishcloth, so we’re in a major attitude of gratitude. Hello-Hello, happy new week to you! We all know that no one loves a bargain better than preps, so I thought it might be fun to spend a little time this spring looking at alternatives to our standard haunts and brands, we’ll veer clear of Brooks Brothers, Talbots, J. Crew and the like. The shirt is cotton poplin, clearly created to capture some of the “go to hell” styling favored by other prep brands. The Striped Poplin Shirt (originally $28, now $21) incorporates similar styling, it is available in two different colorways. One of the most appealing aspects of the shirts is the discreetly placed logo, small, just above the vent at the side seam. Another basic from Stafford Prep, the Cotton Piqué Polo, comes in a broad selection of colors. Originally selling for $18, the shirts are now $13.50. For the ladies at your palace, the Short Sleeve Polo shirt on the far left is $16, it offers updated styling with a slimmer fit and extended button placket, some versions are discounted to $11.99, including petite sizes. Prices for Targét’s basic School Uniform Polo are only $6.48 to 12.99 in junior sizes, shown on the far left. No one is going to know it’s for a school uniform, and it is a durable garment from what friends say. Below center we show the Men’s Mossimo Polo, it also comes in a wonderful array of colors and is priced from $12 to $14.99. If seeking something for your little Master of the House, the Cherokee infant Toddler Boy’s Polo on the far right is $7. For comparison’s sake we show the Double L Polo from LL Bean. The shirts are $15.99, and you do get the cute little Bean boot logo. However, that is because these are on sale, the original price was $32.95. Other polos are on sale at Bean, and they are great buys. Non-discounted polos at Bean seem to start around $25, at Lands’ End it looks like they start around $24 or $25 as well. Kohl’s also carries a number of basics, and like other discounters they use promotional pricing much more heavily than Bean or Lands’ End. Most (if not almost all) shirts appear appear to be on sale, we show the Croft & Barrow® Solid Piqué Polo, originally priced at $18, now $9.99. A basic solid shirt can do yeoman duty, we share several more from JC Penney. On the far left we see a top from the retailer’s new Joe Fresh collection, brought on with much ballyhoo, the Voile Shirt comes in a number of colors. In the center, JCP’s Long Sleeve Oxford ($24.99), and on the far right, the Silk Sleeveless Henley Top ($39). Shoes with a prep aesthetic aren’t always as simple to find, although reasonably priced flats seem to abound at most discounters. Below, Target’s Madge is offered in a range of colors and textures, at $17.99 they may not last forever, but they sure will do the trick in the short term. Target’s Ona Striped Scrunch Ballet Flat is just $19. There really is a solid selection of preppish basics available, including discount department stores. It’s a matter of knowing what you want and keeping on eye on quality: is the construction solid? are seams finished well? are plaids matched at the major seams? Another thing to keep in mind, most of us prefer all natural fabrics: cotton, linen, wool. Polyester can make an otherwise wonderful piece feel entirely different, including making it uncomfortable in warm temps. Depending on the garment maintenance could be more involved; as a rule that has been worth the extra effort in the long run. We leave you with some madras pieces we discovered at Target: the Women’s Merona® Lari Boat Shoes for $15, Men’s Shorts that are 50% off (now $12.48), Men’s Tie in Navy Madras Plaid at $19.99, and Womens Zulima Plaid Rain Boots, $29.99. Until next time, may the sun be shining wherever you may find yourself today. 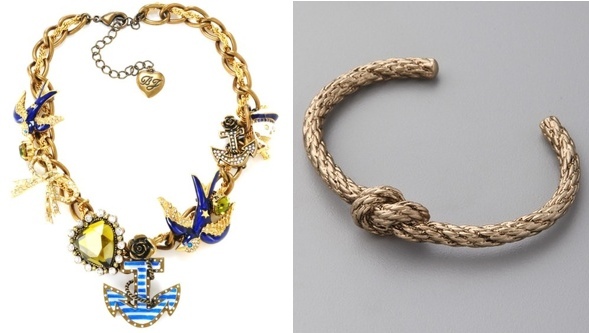 Tiffany and Brooks Brothers and Prada Have What in Common? Hello-Hello, and welcome to a Thursday here at the Prepatorium. In an effort to move beyond the day’s headlines, we move back to our previously scheduled post. We have a look at some of the products tied to the soon-to-be-released Great Gatsby film from Baz Luhrmann. The marketing machine is really kicking in, and we’re not necessarily talking about the movie’s May 1st première. No one will be surprised to learn a sizable amount of buzz surrounds the costumes, those have been overseen by Costume Designer Catharine Martin. Gatsby-related magazine covers have been visible for months, now the big fashion splashes are getting underway. Below, Vogue Australia’s May cover with Karlie Kloss. We are so excited about Baz Luhrmann’s The Great Gatsby that we dedicated our whole issue to it. There are reports the dress worn by Ms. Kloss in the photo above is one of those designed by Miuccia Prada for the film. Above we see it on actress Carey Mulligan, she stars in the iconic role of Daisy. The dress is from Prada’s spring/summer 2010 collection, it looks like Ms. Kloss is wearing it with the front/back reversed. Australian director Baz Luhrmann called in a favour from a 16-year-old friendship when he tapped Miuccia Prada, of the famous fashion house, to collaborate with himself and his designer wife Catherine Martin for the costumes in the sumptuous production. In an exclusive interview in Vogue Australia’s May issue out tomorrow, Prada discusses the results, including an incredible dress designed for Carey Mulligan – playing Daisy Buchanan – which is covered in crystal chandelier drops. Two of the Prada costume sketches via Fashion Foie Gras. Just in case you are wondering, the collaboration between Miuccia Prada and Baz Luhrmann is not completely out of left field. The two have had a long friendship and actually collaborated recently for the Miuccia Prada / Elsa Schiaparelli exhibition at the Metropolitan Museum of Art. However, the original link to film goes back much further. Sixteen years ago, Miuccia Prada actually worked with Baz Luhrmann to create Leonardo Di Caprio’s suit for his 1996 remake of Romeo+Juliet. Another big cover tied to the movie’s release, US Vogue. 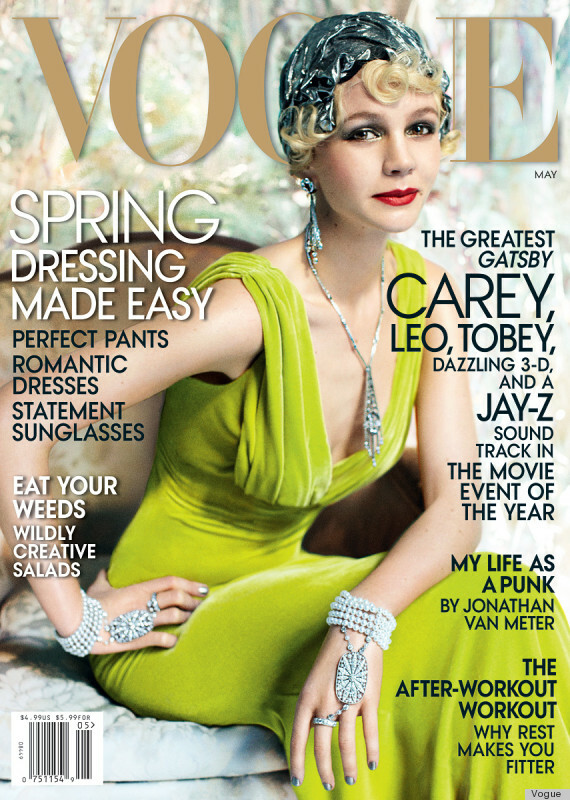 Its May issue showcases Carey Mulligan on the cover. Retailer Brooks Brothers just launched its Gatsby Collection. “Brooks Brothers is mentioned several times in Fitzgerald’s writings as a representation of the ultimate gentleman’s purveyor of fine clothing to the American man of distinction. The collaborative effort, unprecedented among past Brooks Brothers partnerships in its depth and scale, consists of formalwear and daywear, including tuxedos, tailored suits, suiting separates (sport coats, waist coats, and trousers), shirts, ties, shoes, and accessories. The Brooks website offers background on its collection, including a peek at several archival images. Below we see several straw boaters. A final look from Brooks Brothers. While the collection is clearly not intended for Brooks’ traditional customers (like yours truly and the Consort) it is creating substantial buzz on retail and menswear blogs. It will do well. Another storied brand with pieces used in the film, Tiffany. Above we see The Savoy Headpiece, crafted of diamonds and freshwater cultured pearls set in platinum. It can be yours for $200,000. 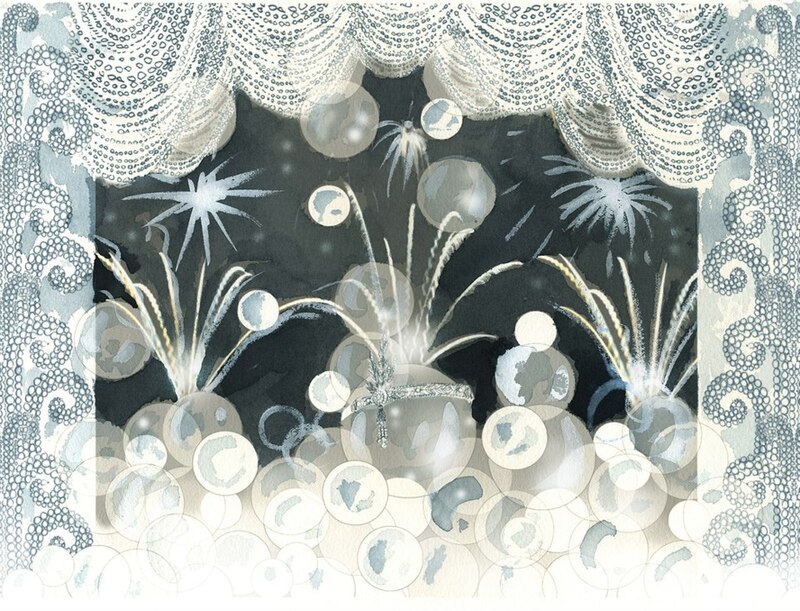 Yesterday Tiffany unveiled its Gatsby themed windows. Last night there was a soirée at Tiffany’s Fifth Avenue store celebrating the collection. “… (Martin) was drawn to the jeweler because F. Scott Fitzgerald himself was a Tiffany & Co. customer and Louis Comfort Tiffany, the brand’s first design director, ran with the Long Island social circles portrayed in the story. 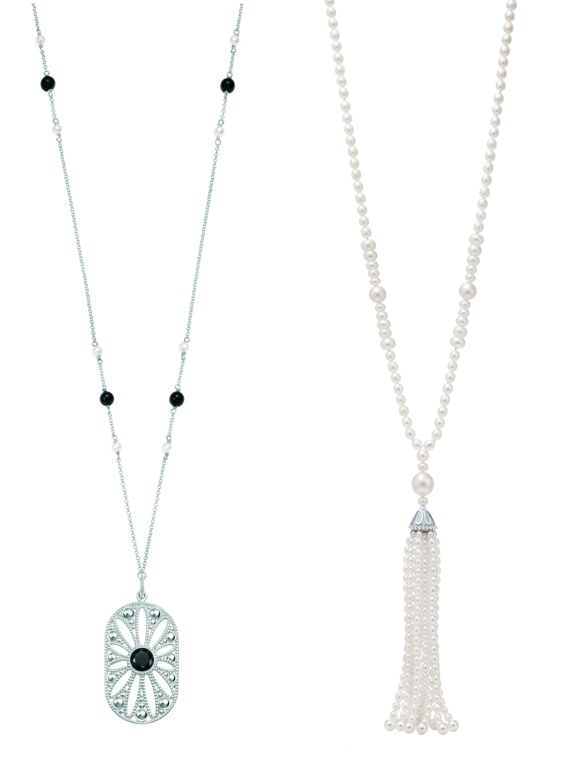 From the Tiffany Ziegfield Collection, we show the Daisy Pendant in sterling silver with black onyx and freshwater pearls ($400) and on the right, the Pearl Tassel Necklace with sterling silver ($1200). Also from the collection, we show the Pearl Ring ($475) and Cuff Links ($375), both done in sterling silver. Both the Tiffany and Brooks Brothers collections are available for purchasing in stores and online now. The Great Gatsby opens nationwide in the USA on May 10, it also headlines Cannes May 15. Until next time, may the news be brighter wherever you may be.